Battle Royale is a wrestling game that presents last-man-standing type battles between up two five wrestlers. 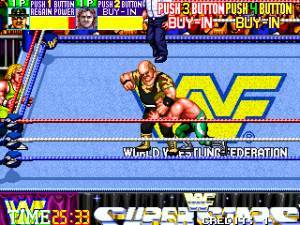 The game features three difficulty settings, five wrestlers to choose from, and two game modes. For single players only is the tournament mode, featuring 15 possible consecutive battles, beginning with one-on-ones and continuing up to a full five-man match. In the second mode, the number of competitors can be freely set for a single match. There is a catch in how a player chooses their wrestler, though: before the match, the fighters' managers duke it out on their way to select their favorite fighter - temporarily knocking out the opposition is encouraged. 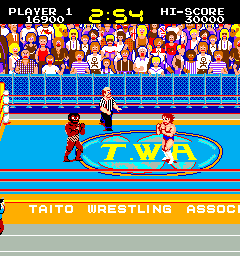 The matches take place in a side view of the ring. The A and B buttons are used for a variety of kicks and punches and the Select button can be used for an extra powerful attack. The goal is to toss the opponents out of the ring and remain the last man standing.